One of the most enjoyable aspects of my return to Aberdeen has been to start a programme of visits to schools across the north-east. I regularly meet with head teachers and key staff and see for myself the talent and potential of pupils in our local communities, some of whom may be considering a future in higher education. These visits hold a particular resonance for me, as I remember my time as a pupil at King Street Primary School and how distant a university education seemed to most of us who grew up in working-class backgrounds. 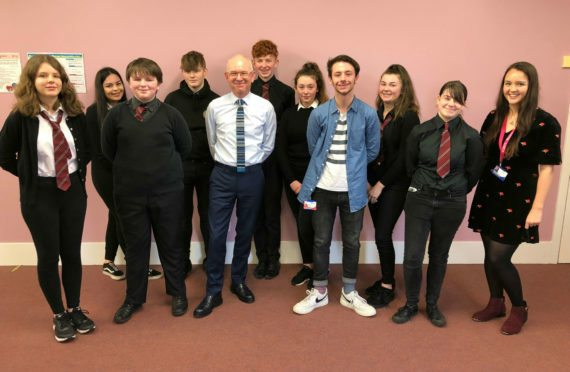 Having already spoken with head teachers and pupils at St Machar and Lochside academies in the city, last week I took a trip up to Peterhead Academy, where I met with a group of pupils for a chat about their ambitions for the future. What struck me was their sheer enthusiasm for learning, and how sad it would be if – for reasons beyond their control – they were prevented from reaching their full potential. Ultimately, my own pathway to university was relatively straightforward. But I am conscious that for many of our young people this might not be the case. Indeed, for school pupils in disadvantaged circumstances, higher education might represent a challenge that is at best daunting, or at worst seems umachievable. Since returning to the University, I have been guided by the foresight of Bishop Elphinstone, who on founding King’s College in 1495 stated his ambition ‘to found a university which would be open to all and dedicated to the pursuit of truth in the service of others’. It is with this in mind that I was delighted to announce late last year that the University aims to double the number of full-time Scottish degree students we recruit from the SIMD20 postcode areas – the most deprived fifth of the country – as part of our commitment to improve access to higher education. We made our pledge to recruit 10% of Scottish students from those areas in Scotland during a visit to the university by Richard Lochhead, Scotland’s minister for further education, higher education and science. I was pleased to discuss with him the unique challenges we face in terms of recruiting students from these postcode areas, in large part due to the very low proportion of postcode areas in the north-east classified as such by the Scottish Index of Multiple Deprivation. Despite these difficulties, the fact remains that this measure is used to define the university’s widening access targets, which we sign up to as part our joint outcome agreement with the Scottish Funding Council. Since the introduction of our ambitious target we have adopted several bold measures to attract students from deprived postcode areas. For the first time ever we have remained open to these applicants beyond the UCAS deadline of January 15th and until after the release of the Scottish school exam results. This move is backed by a planned campaign of awareness-raising via social media and through schools in order to reach those most likely to benefit. In addition, we are offering a year’s free accommodation in our halls of residence for students from SIMD20 areas as we aim to make university more accessible to students from disadvantaged backgrounds. The introduction of these measures provides fresh impetus to our extensive widening access activities, which regardless of any targets set for us by the Scottish Funding Council, I consider to be a priority area for the university. It is through initiatives like this that we aim to encourage engagement from pupils with aspirations to attend university, no matter their background or individual circumstances. Likewise, our commitment to double the number of SIMD20 students coming here is another important expression of our commitment towards greater inclusion. These efforts will continue as we seek to enhance our approach to widening access and ensure – just as Bishop Elphinstone envisaged over five centuries ago – that a University of Aberdeen education is open to all.